*Update October 2017: The island of Dominica was hit by a category 5 storm, Hurricane Maria, in September of 2017. The information on this blog reflects life in Dominica prior to Hurricane Maria. Some of the businesses below may be open for business, under repair, or no longer in business. To contact the author with any changes, please email louisiana2dominica@gmail.com or comment below. Thank you! Walking – totally works if you live near campus and will spend most of your time there. Buy a bike. I’ve seen bikes for sale at Courts (above IGA grocery), James Store, and P & P Trading in Picard and at Astaphans in Roseau. Astaphans home repair center in Fond Cole also has bikes. Sometimes you can luck out and buy one from a student who is leaving the island. Buy a secure bike lock. There is a bike rack in front of the library and near the gym where you can lock up your bike. A1 taxi (767-445-4154). Serves Picard and out of the area as able. It will cost you 8 EC (3 USD) to travel one way from Picard to Portsmouth. Trinity Taxi Service (767-276-7456). Services Picard area and reservations can be made for other outings. Alexis George’s Taxi Service (767-235-5326 aka the guy who picks up your barrels from customs). His office is on the main road, between the shacks and James Store. He is on the 2nd floor of the Martin Titre pastel colored building. He has busses/drivers for hire that can take you to the airport, take you on an excursion, or taxi you around the area. 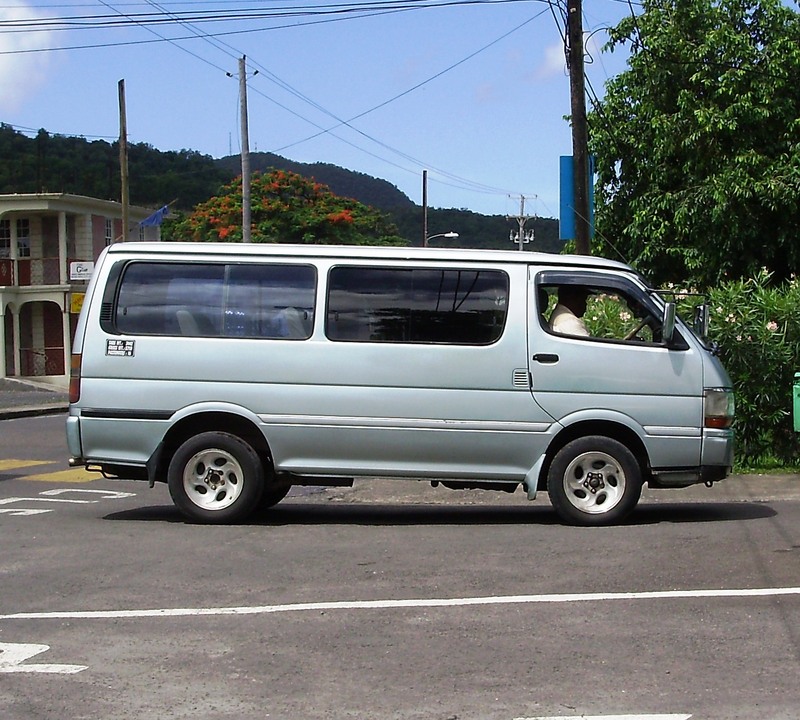 Hire a personal bus driver for the day -For a list of recommended taxi drivers that are for hire visit the Ross University Practical Guide to Dominica. These drivers will quote you a daily rate or a per person fee for the day. They will take you wherever you request-excursions, shopping trips etc. Public transport bus. (Note that government approved drivers have a license plate that begin with the letters HB, hired bus.) There are some bus stop stands around the island, but you hail a public transport bus just as you would a taxi. In Dominica they say the bus stop is “wherever your feet are”. It will cost you 1.50 EC (.60cents US) to travel one way from Picard to Portsmouth. It will cost you only 9 EC (3.35 US) to travel one way from Picard to Roseau, which is a one hour journey. Usually no transports run on Sundays or late evening. For a list of other rental car businesses click here . Buy a car from a student who is leaving the island or have Alexis George import you one. There is a car dealership in Canefield called Auto Trade LTD. Also, check out Al Motors LTD in Canefield (767-449-1972).You can have your car shipped from the US to here. However, keep in mind that customs fees for automobiles are typically 100-150% the value of the vehicle (OUCH!). Certain brands, like Ford, the local mechanics don’t have a lot of experience working on them. Finding car parts may be difficult no matter what kind of car you own. ***Keep in mind that Ross University provides free weekly trips to the capital Roseau on Saturdays. The shuttle leaves from the library at 8:30 and picks up from the Bay Front in Roseau at 12 noon. Ross also provides a free service of nightly transport from the library to your front door (in Picard/Glanvilla) starting at 6 pm-12 am, every half our the tram arrives. After midnight till about 2 am ? the tram leaves the library every hour. ***Note that during semester breaks, these shuttles usually do not run. You can also rent scooters from CampusLife Scooter Rentals (767) 265-2496. It’s located across the street from the Ross University Student Center. Thanks for the info Brittany. Jane, I’m not aware of any place where you can rent mountain bikes. There is one place listed in Paul Crask’s Guide to Dominica, but their website is not up and running, and they are on the opposite end of the island-Nature Island Dive 767-449-8181. I think your best bet would be to have your daughter join the Facebook Group called “Dominica’s Craiglist”. On there, people advertize things for sale/rent. You may be able to find some students willing to rent their bikes for a week.